We are always looking for delicious but easy recipes. This recipe for baked potatoes stuffed with eggs is a great recipe to know how to make well because you can eat it for any meal and serve it for any occasion. If you’re hosting a brunch at your home, this is an easy dish to make in bulk. Serve it with some fresh fruit and juices, and you’re sure to impress your guests! It can also be a delicious choice for a casual dinner get-together. Serve it with a light salad and a simple dessert for a wonderful evening. Our baked potatoes stuffed with eggs are perfect to make for yourself and your family. If you’ve had a long day, you don’t have any complicated prep work to do. While the potatoes are baking, you can kick up your feet and relax before digging into a delicious dinner. Or, if you need to fuel up before a busy weekend, this recipe works great, too! Follow our recipe below to see how easy it is to make this dish. Wash your potatoes and pat them dry. Wrap each one with aluminum foil. Poke the potatoes several times with a fork to let them vent while they bake. Once the oven is heated, place the potatoes into the oven and bake for 45 to 50 minutes. While the potatoes are in the oven, prepare the bacon. In a medium skillet, cook the bacon over medium heat. Saute it to cook all the pieces evenly. The bacon should be crispy. When it’s done, transfer the bacon to a paper towel-lined plate and set it aside. When the potatoes are done, allow them to cool slightly and lower the oven’s temperature to 350°F. After they have cooled a bit, cut a thin layer lengthwise off the top of each potato. Using a spoon, gently scoop out the inside. Leave a thin layer of potato over the skin, and make sure to not break the skins at all. Place the mostly hollowed potatoes onto a baking sheet. Save the scooped-out potato for another time. Brush the inside of each potato with melted butter and sprinkle with salt and black pepper. Put cheese inside each potato as the first layer. Add chopped green onion and bacon overtop the cheese. The potatoes should be about 3/4 full at this point. Crack an egg into each potato and sprinkle the top with more salt and black pepper. Bake the potatoes at the reduced temperature for 20 minutes. The egg whites should be set, and the yolks should still be slightly runny, not overdone. After the potatoes come out of the oven, serve immediately. Add additional toppings if desired. You can always make a great recipe truly special when you use amazing ingredients. 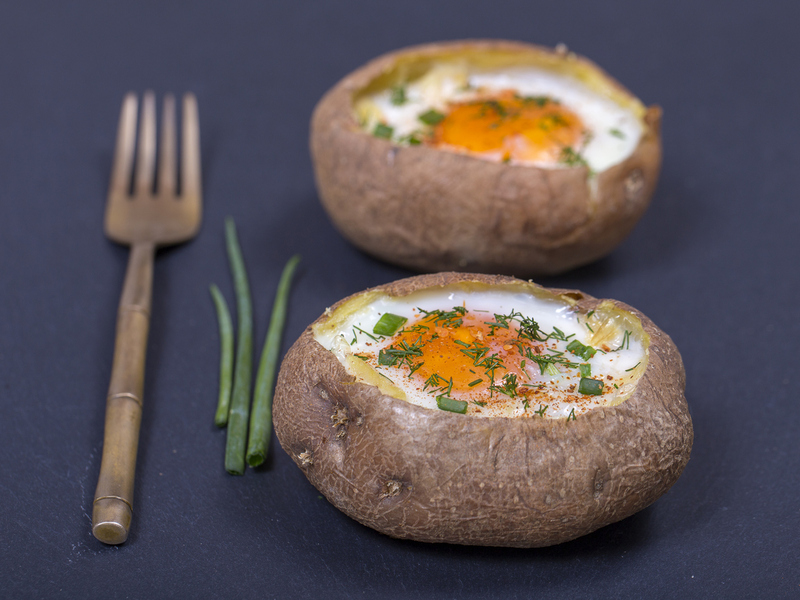 When you’re preparing this recipe for baked potatoes with an egg inside, using Sauder’s eggs will make it even tastier. With our dedication to providing the best eggs, we know you will be happy with the result. If you need help finding our delicious eggs at your nearest retailer, check out our store locator today!